This lively well-written tale introduces Rose, a practical and determined orphan. The other girls at St. Bridget's Home for Abandoned Girls imagine the wonderful lives they should have led. Rose has a simpler dream: a job in domestic service where she can earn her own money. She is not exactly unhappy at the Home and is popular for the extremely realistic stories she tells, but she wants to determine her own fate. Fate, of course, has its own agenda. When the housekeeper for a famous magician chooses Rose as the new second housemaid she thinks her dream is coming true. Things are a bit more complicated. She has to learn her duties, fit in with the staff and deal with the sometimes difficult, upstairs residents. It doesn't help that strange things happen in the house that the other staff cannot see. And children are disappearing in the neighborhood. Ooh! How many things does this book have that I love? 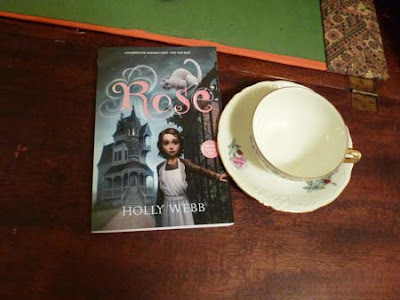 Holly Webb evokes the feel of a city like Victorian London where magic exists but only the rich can afford it. I can't wait for the next installment. In the meantime I will check out Holly Webb's other books.